Source: From ref. 7. INR, international normalized ratio. (2) reduced thrombogenic (or clot forming) potential. Efforts to optimize valve hemodynamic function date back to the development of the Lillehei/Kaster tilting disk valve, which allowed blood to flow centrally through the valve. At that time, this new type of valve emphasized the requirement to design a valve that would reduce turbulent blood flow, reduce cell destruction, and minimize the transvalvular gradients (4). A transvalvular gradient is defined as the pressure difference across the valve. Despite the advantages of a new steel tilting disk design, careful and strict anticoagulation therapy was still required to reduce the risk of clot formation (5). The next improvement of heart valves came with the development of the pyrolytic carbon valve leaflets. The nonthrom-bogenic properties, weight, and strength of pyrolytic carbon were described by Drs. Jack Bokros and Vincent Gott. Subsequently, pyrolytic carbon was used in the creation of a bileaflet valve, inspired by an idea of Dr. Kalke. This valve, manufactured by St. Jude Medical (St. Paul, MN), provides exceptional performance and remains today as the gold standard of valve designs (6). Yet, since the first implantation, efforts to design the ideal mechanical heart valve prosthesis were affected by the challenges of thrombogenicity, turbulence, and hemolysis. Currently, all patients with mechanical valves still require anticoagulation therapy, typically with oral warfarin; the use of this agent has reduced the risk of thromboembolism to 1-2% per year (Table 1) (7). It should be noted that numerous studies have demonstrated that the risk of thromboembolism is related to the valve implant type, in the descending order of a tricuspid, mitral, and aortic implant. In addition, this risk of emboli appears to be greatest in the early postimplant time period and then reduces, as the valve sewing cuff becomes fully endo-thelialized. In general, management of anticoagulation must be individualized to the patient, so to minimize risk of thromboembolism and at the same time prevent bleeding complications. When a patient with a valve prosthesis requires noncardiac surgery, warfarin therapy should be stopped only for procedures with a substantial risk of bleeding. 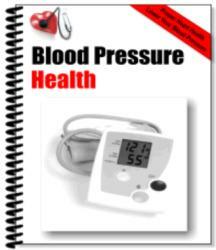 A complete discussion of anticoagulation therapy is beyond the scope of this chapter; however, several excellent reviews are available on this subject (7). Because of the problems related to anticoagulation, much clinical research has focused on developing a tissue valve alternative that avoids the need for anticoagulation. From a historical perspective, Drs. Lower and Shumway performed the first pulmonary valve autotransplant in an animal model (8). In 1967, Dr. Donald Ross completed the first successful replacement of such in a human. The Ross procedure is a well-established method used today; to replace a diseased aortic valve with the patient's own pulmonary valve (Fig. 5). 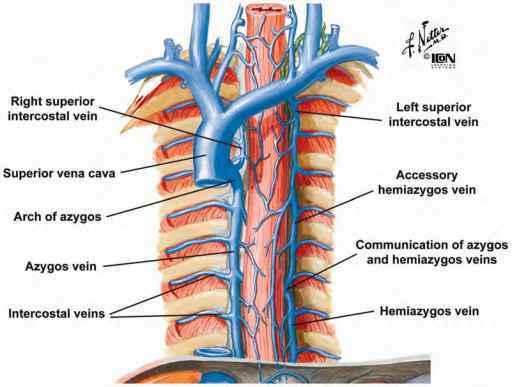 A donor tissue valve or homograft (Table 2) is then used as a prosthetic pulmonary valve. Fig. 5. Schematic drawing of the Ross procedure. 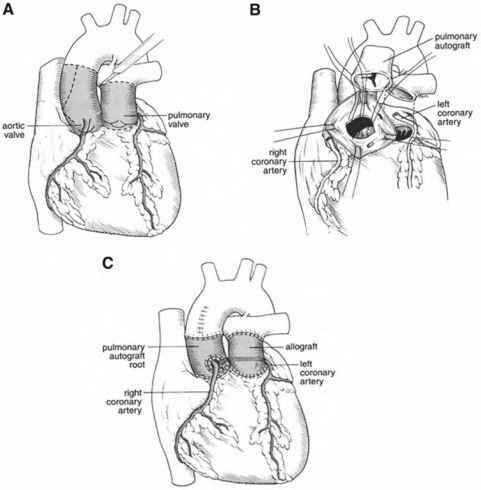 (A) Resection of the diseased aortic valve. (B) Harvesting of native pulmonary valve. 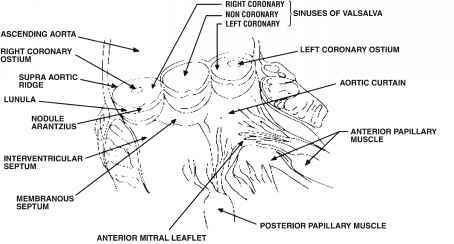 (C) Implantation of the pulmonic valve in the aortic position and reimplantation of coronary arteries. In general, tissue valves are significantly more biocompatible than their mechanical counterparts. These valves are naturally less thrombogenic, and thus the patient does not require aggressive anticoagulation. Specifically, a risk of less than 0.7% per year for clinical thromboembolism has been reported in patients with valve replacement eliciting sinus rhythm without warfarin therapy (7). Therefore, this treatment option is advantageous in clinical situations when the use of anticoagulation would significantly increase the patient's morbidity and mortality. Yet, a potential major disadvantage of tissue valves is an early valvular degeneration as a result of leaflet calcification. Methods for tissue preservation to prevent calcification are currently a major focus of research in this field. The choice of a mechanical or biological valve implant will depend on the patient's disease, the specific native valve involved, and the surgeon's preference and experience. If these factors are not limiting, the choice of valve type should be based on the maximization of benefits over risks for the individual patient. Mechanical valves offer greater durability, but at the cost of requiring lifelong anticoagulation. As such, mechanical valves are well suited for a younger patient who does not desire future reoperations. Currently, mechanical valve replacement has been standardized and is commonplace, yielding satisfactory valve function that is quite reproducible from patient to patient. The flow gradients with newer bileaflet mechanical valves have dramatically improved from the early ball valve type; currently, a trileaflet valve is in the preclinical stages of development and may eventually not require anticoagulation therapy (see Fig. 2 in Chapter 21). In the interim, bioprosthetic or tissue valves offer a safe alternative for patients in whom the risk of anticoagulation is prohibitively high (e.g., elderly patients older than 70 years of age, women of child-bearing years desiring pregnancy). Yet, the length of durability remains a serious concern for tissue valves, and thus a patient whose life expectancy is greater than that of the prosthesis will encounter the risk of another surgery for a second valve replacement.